If you’re reading this then you’re probably like me a few years ago, sat wondering how to start blogging at home. In this section we're looking at how to set up a blog to get started blogging in your spare time. Before we start I wanted to make one point clear. Blogging doesn't have to be difficult or expensive. You don't need to know the first thing about blogging, computers or even how to write any code, to start your blog. The first decision you do need to make is what you're going to be blogging about. Personally I think it's important you blog about something you're passionate about. If you're passionate, there's a good chance you'll never get bored of writing content for your readers. What are you passionate about? Can you show people how to do something? 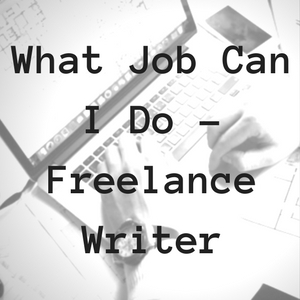 I blog because I am passionate about providing career advice to my students. More specifically, trying to help them find the career of their dreams. That all said, I know plenty of people that blog because of the income that it generates. If you don't believe me when I say you can make a Full-Time income from blogging alone, take a look at this blog post that contains 100 monthly income reports from bloggers that are growing a full-time income from their own blog. Below are my six of my favorite blogs from across the internet. It's important to remember, each of these blogs started from zero. SmartPassiveIncome.com - has been built by Pat Flynn who started the blog in 2008 with the aim to share strategies that have helped him grow his online business. Whilst, it's taken over 10 years to develop, Pat is consistently earning upwards of $100,000 each month. JonnyFD.com - is where Jonny talks about his world as a digital nomad whilst developing his online presence. Whilst creating multiple streams of passive income, he has developed an online business that's producing upwards of $80,000 Per year. MyPerfectBlog.com - has been created by Jon Dykstra who documents his life as an affiliate marketing specialist. Jon creates affiliate based websites that create an income that at last count in 2018 is over $27,000 per month. Affiliate marketing is a great example of a blog that creates an income for its owner. PinchOfYum.com - is a food blog where Lindsay writes, cook's, and the takes pictures of delicious food. She also makes a considerable income from her blog and whilst she's stopped publishing her monthly figures, at the end of 2017, the blog was making over $30,000 each month. justagirlandherblog.com - is edited by Abby who started Just a Girl and Her Blog in January 2013 when she wasn’t even quite sure what a blog was, but needed a creative outlet and decided to give blogging a try. Over the last few years, she had built the blog into a powerhouse of ideas and at last count was making over $40,000 per month from a range of different incomes. makingsenseofcents.com - is a personal finance and lifestyle blog created by Michelle who is of all things currently touring North America and living in an RV. She writes about all things personal finance and has turned a blog into a business that in April 2018 made over $200,000. You can read about this here. Once you've decided what you want to blog about, your next job is to think about the name of your blog and in-turn the domain name that you're going to use. Choosing a domain name is probably the most difficult part. Your domain name is going to be associated with your blog, your email and potentially your brand for the foreseeable future. On a personal note, I found choosing a domain name very time consuming. Over the last few months, I've bought a few domains that I thought were great names before settling on The Career Advice Guy. The Number One rule when choosing a domain name is to make it easy to type and to remember for the future. If you use slang such as "U" instead of "You", dash's (Nick-Jones), and numbers (5 or Five) it might be harder for readers to remember your blog in the future. In the past, i've registgered the domain name TheGreatOutdoorMagazine.com with the plan that I thought I would build out a fantastic outdoor blog. Obviously I didn't do any research or realize there was already and business called the The Great Outdoor Magazine in the UK. If i'd kept going with that website, it probably would've ended up with a letter from their lawyers telling me to take it down. Unless you're really specific with your niche and as an example planning to build a photography website in which case you could easily build out a .photography, I'd be sticking with the .com's. If you're really stuck choosing a domain name. Try using a domain name generator. There's a great blog post with 15 of the best domain name generators to help you find your domain, however my top three are below. http://wordoid.com - This is simple word and domain generator. You plug in a word that you want your domain to contain and program generates suggested domain names. https://www.leandomainsearch.com/ - This is the next step up where you plug in keywords into the search function and the website will produce a selection of relevant domain names. http://www.domainhole.com/ - This is more of a domain name platform to help you find the best domain from everything across the internet. Whether its a new domain and needs to be registered, an old domain that you need to take over ownership or a for-sale domain where you need to buy it, this website has it all. You can choose anything you want, however keep it short and clean. Remember, it's likely that you will set up your private emails going to this domain. Pre-2000 if you wanted to create your own blog, you had use your coding skills to tell your browser what you wanted to display and how you wanted it to be displayed. This was very complicated process that involved a lot coding knowledge and programming skills that many people simply did not have. More recently WordPress was brought onto the market and allowed users to skip the coding and head directly into creating a website that showed off their style and fantastic user content for your readers. Today WordPress is the number one blogging platform in world. It's been downloaded over 80 million times. Bloggers use WordPress because it's free, very easy to use and requires no technical coding experience to change themes to suit your individual taste, whilst easily allowing you to write blog posts, add images or video to you blog. WordPress comes in either a free version at WordPress.com or a Paid Version at WordPress.org. The key downside of the free version is that you don't own the domain name and therefore your blog will have a url such as www.something.wordpress.com. This type of domain cannot be used for a professional email. The Self-Hosted version of WordPress is not free, but at the same time is not expensive. For a complete set up with a reputable company, you need to budget for yearly costs of around $50, breaking down to $10 for the domain and another $40-70 for the hosting per year and the ability to send emails through your domain. Once you have decided upon your domain name, you’re then going to need to buy your domain and somewhere to host your website (somewhere to keep all the files needed to run your website). I would really suggest that you buy your domain and hosting package together in the same place as you will save money, time and it's much easier to set up and manage over the longer term. There are lots of companies on the internet, however I would recommend that you use iPage.com. I have used iPage to host my websites over the last six years and there has never been a problem. Their service is cheap, super fast and most important their customer service is fantastic with support via email, phone and an online chat system. They also offer a 30 day money-back guarantee and will give you a domain name for free when you register. iPage use wordpress as one of their major website builders. They not only offer support for any problems that you may encounter, but also offer a “one click blog installation” to make the whole process easier and very fast. The whole process of getting your website up and running, literally takes 10 minutes. What on earth do these words actually mean? Domain name is what you type into your browser each time you want to be taken to a website. For example, if you open a new browser and enter www.careeradviceguy.com, you will find yourself here at my website. Hosting and Servers mean the same thing, being your space on the internet that you're going to rent each month to save all the files needed for your website to run correctly. When you buy Hosting for yourself, there're literally hundreds of options across the internet in a range of difference sizes and prices. Personally, I would highly recommend that you head across to iPage.com and get servers from them. They're cheap, reliable and most importantly trust worthy. This blog is hosted on iPage.com and I've never had any problems. What I really like about iPage, if you do have problems, either call them or login their chat feature and they sort it out quickly and easily. Ipage.com is one of the oldest hosting providers on the internet having been hosting businesses and personal blogs since 1998. Over the years, they've developed a way for even the most basic blogger to get online. It literally take 10 minutes from start to finish to get your blog online. There is no coding, no technical knowledge required as everything is easy to use. What I really like about iPage over the years is the support provided both online with their step-by-step instructions, but also the support when you run into problems. Two years ago, this website got hacked and iPage were on the phone sorting out the problems in seconds. Their experienced web hosting staff are available 24/7 to assist you with anything you need. Firstly you need to head over to iPage.com and click on the "get started now" button in Red as shown below. The next screen is where you're allowed to choose your domain name. You have two choices, either iPage will find and manage a domain name or if you've already bought a domain name, enter it here and iPage will associate it into your account. If you're buying a new domain name and the name is already taken, this page will let you know and you'll need to think of an alternative. As you can see below, I've tried to buy NickJones, however nickjones.com is already taken. I therefore have a choice, either I take nickjones.info or search for another domain. Once you've chosen your domain name, the next screen allows you to choose the length of your plan. Remember, it's $1,99 if you choose the three year account and will remain $1,99 for the three years. Again as mentioned above, the domain name is free, so you can have you domain and website up and running for three years for $71.64. The customize section is where you get to add different optional products to your server. Some are very useful, whilst others, rather expensive and totally pointless. Below, I've provided you with a list of these products, what they actually do and made recommendations to which I think are useful, and which are totally pointless. Domain Privacy Protection – Very simple, any information that is associated with your domain (apart from your credit card details) will be available on the internet for the world to see. If you choose privacy protection, this information will be protected. Personally I have this with my account, however its really up to you. SiteBackUp Pro – Backing up your hard work is very important as the last thing that you want to happen is for all you hard work to be lost due to something out of your control. It's a little expensive, but the time and effort saved its well worth it. 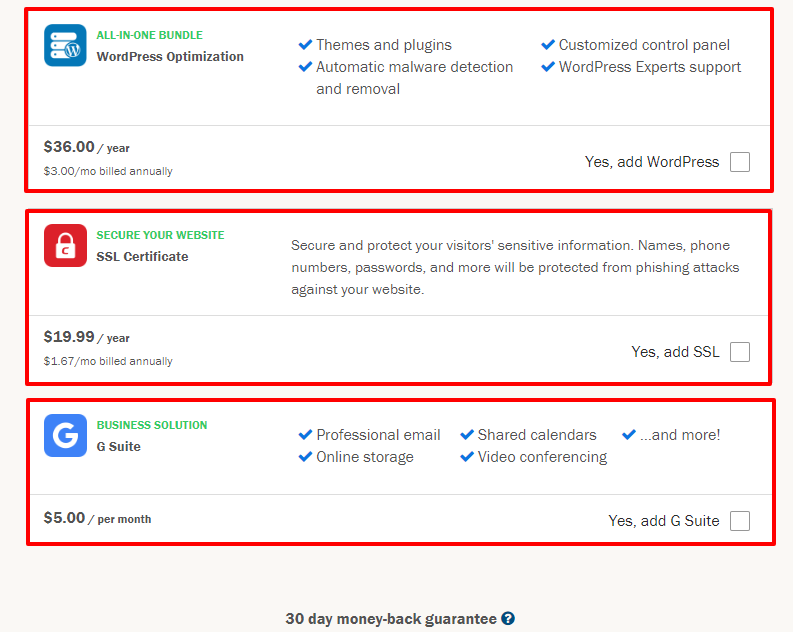 If you cannot afford the extra $36 per year, don't worry there are other ways to backup your wordpress website. Website Security – Simply means that your Domain is secure meaning that no one will be able to take your domain a-way from you. Personally, this is not important unless you get to the stage where you have an international brand worth thousand and then hackers will likely try there best to steal your domain name to make money. All-In-One-Bundle - This is another cracking add-on, but its very expensive for what it actually provides. Across the internet there are a selection of free wordpress themes, useful plugins and expert help is readily available. Personally I don't think its worth it. SSL Certificate - This is something you will need if you're planning to make a full income from your blog. I'm not going into the details, but basically it's a digital certificate that authenticates the identity of a website. If you want to read more on SSL certificates, there is a great video here from Network Solutions here. Personally I think this is worth it. G-Suite - This is the same as Gmail, but allows you to use your domain name as an email address. 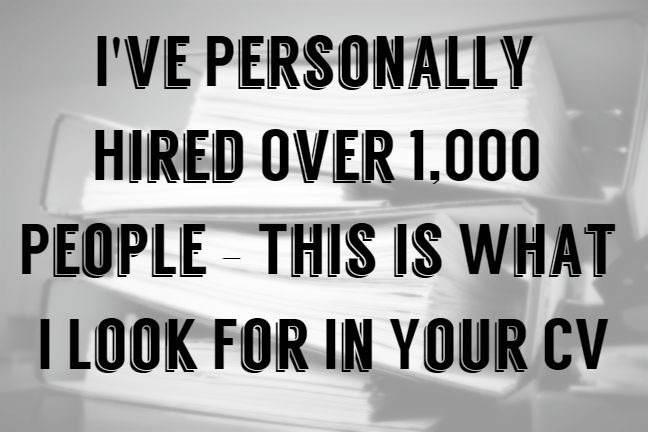 If you're looking for a new job and sending out your CV to hiring managers, a professional email will help. Again, I would highly recommend it. This last screen is where you need to enter your billing information. You have a choice to either pay your credit car or by Paypal. As discussed above, I would highly recommend that you choose the Domain Privacy, the SSL Certificate and the G-Suite meaning that you'll pay $106.62 plus $5 per month for the email. Remember, there is a 30 day Money Back Guarantee meaning that at any time during the first 30 days iPage will instantly return all your money back should you not be happy with the service. 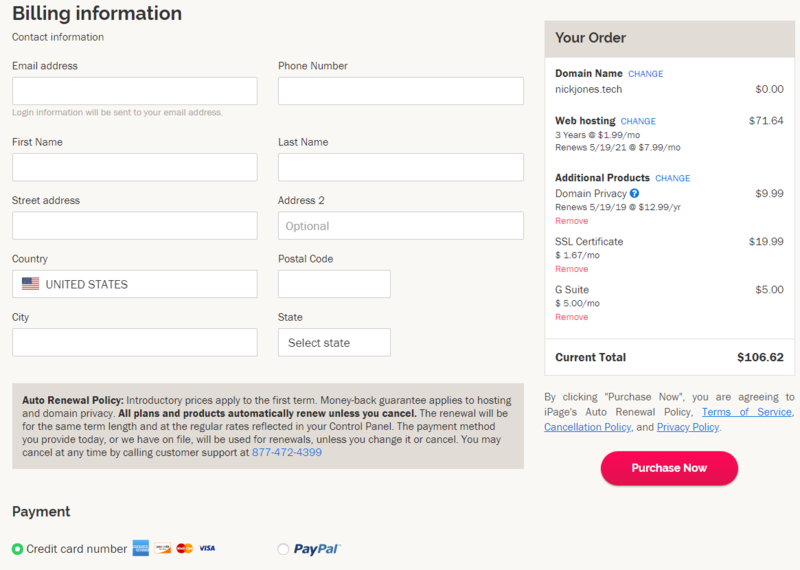 Once you have finished entering your details, click the "Purchase Now" button on the right side to create your account. After you have clicked the next button, you will then be asked whether you would like to have series of following options such as Quick start Coaching or Additional Domains. You can simply ignore these. IMPORTANT - Your username and password will be emailed to you, however remember, these are too your iPage Account and not any websites that you create. We're nearly there - So far, we have chosen our domain name, bought our hosting and now have our account username to your ipage account, but NO password. iPage will email you two email providing you with everything you need to set up your account. The two emails you'll get include an email to "Validate the Ownership of Your Domain" which you simply need to open and confirm. The second email you'll get is an "Order Confirmation and Login Info" that walks you through the process to set up your password. 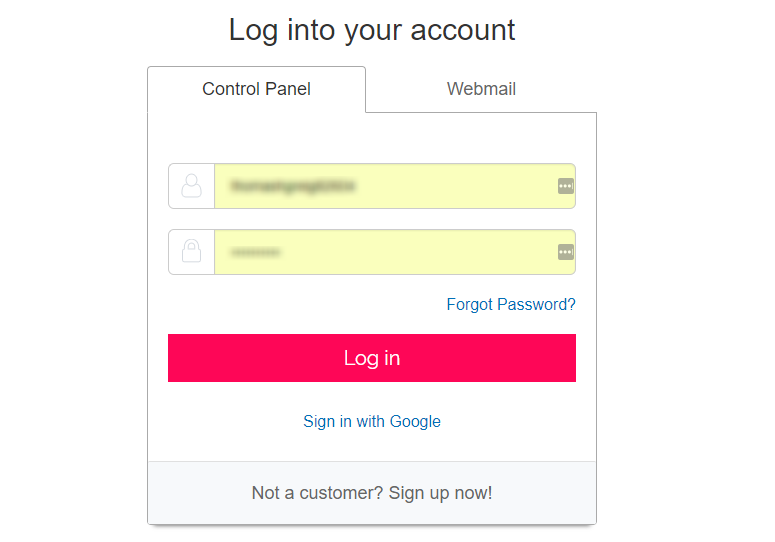 To login, simply head over to iPage.com, head to the right, top corner and click on "login". Note - you also have the chance to sign in with your Google Account if it's linked to your iPage account. The screen below shows my iPage Control Panel which provides a lot of information to control your server. We're not going to go through this today, but we're going to install wordpress on the server and get our website up and running. To do this, head down the left side of the screen until you find the blue title called "Wordpress" as show in the image above. If you have multiple domains attached to your account, you'll be able to see all your domain in this view. For the directory, leave this blank. The last screen you need to fill in is your "admin information". From the image below, most if it will be filled in already, however you're welcome to change it if it doesn't suit your needs. Site Name or Title - What are you going to call your blog? Admin User - This will be the username that you use to login to your website. My advice, choose a username that has no association to your blog and that way you're not giving and easy chance to any hackers that want to attack your blog. 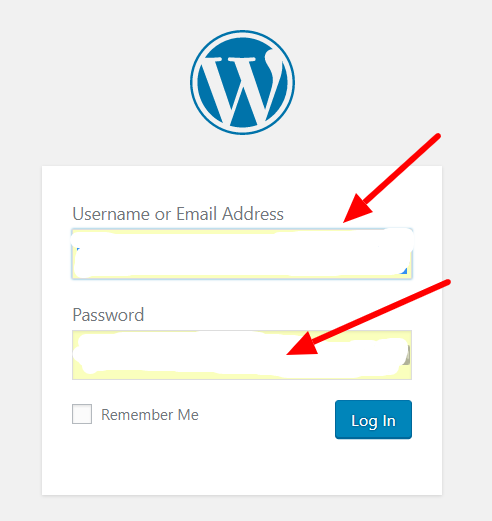 Admin Password - This is the password to log into your wordpress website. Click Next. The process takes a few minutes depending on the speed of your internet. Remember, all the admin information will be sent to you via email. Make sure the email address that you add to your Admin Email Address works and you can receive emails. Congratulations, you're all done. Your WordPress install is complete and you can now start designing your website and writing blog posts. Any problems, contact iPage directly and they will fix any problems you have quickly. NOTE - We did not choose a password for your website. This is because iPage automatically does this for you which will be both emailed to you, and shown to you by hitting the "View Credentials" button as show in the above image. By this stage, you should have bought your domain, set up your server, set up wordpress on your server and be ready to start customizing your blog to make it exactly how you want it. To find your blog, open a web browser and enter your domain name followed by /wp-login/. The first time that you log into your wordpress website, it's going to look really confusing with lot's of options, buttons to press and customization settings that you need to choose. The dashboard has been split into two distinctive areas that will be our control panel. On the left side we have the “Control Panel" that gives us the majority of options to customize our website and on the right side we have the "Dashboard" that generally provides quick links and information about our website. Remember, this might look really complicated at first, however really its very easy and you will quickly become accustomed to what the dashboard does and where you need to go to customize your website. 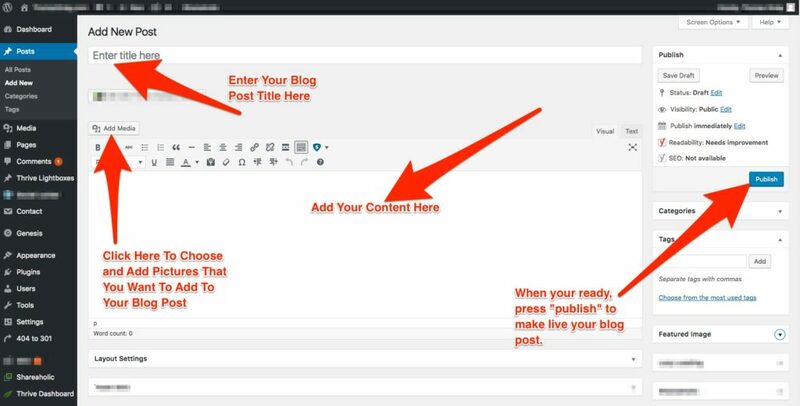 There is a more advanced demonstration of the wordpress dashboard, it's features and workings located here, however below we are going to do two quick things to get you started and blogging. First up we're going to pick a theme that suits your style and what you want to the blog to look like. Themes can either be free or paid, however whilst we're just getting started let's add a free theme to our blog. Adding a theme is very easy and from the control panel on the left hand side we need to press "Appearance" and then "Themes". to bring up the themes page. To add a new theme, simply press "new theme" and choose the theme that you like the look of the most from the thousands on offer as shown below. The second thing we're going to do is to add a first blog post. To create a blog post, again head over the control panel on the left-hand side and hit "Posts" followed by "Add New" to bring up a page similar to the image below. The above image is very simple and show's you were to put your title, how to add media such as pictures to your website, where your content needs to go and how to publish your first blog post. A picture is worth a thousand words, but honest a video is worth a million words and you can head directly over to video instructions from Bluehost on every aspect of this set up and use. Once you have got this far, read our next post for a more in-depth discussion on how to use WordPress and all it's features. How Much Does It Cost To Start Blogging? As you can see above, I've got this blog off the ground and up and running for $106.62. This figure includes by domain cost's, server cost's for the next three years, my SSL Certificate, my domain privacy for this year and for G-Suite for my emails. I suppose technically, my total figure would be $166.62 including the full years worth of email, however you don't have to use Google for your email. That all said, if you want to invest further the sky is the limit to how much it could cost. If you start investing in custom themes, logo's, professional graphics and professional code work to design your blog exactly how you want it, the final bill could be in the thousands. Is It Not Possible to Start Blogging For Free? Yes it possible, however you loose a lot of the control and flexibility that you have with a WordPress blog. Firstly, you you won't get your own domain name and will have to have a Subdomain such as yourname.wordpress.com. Secondly there is no possibility of emails and Thirdly and most importantly, the free versions make you look like a total beginner and not a professional blogger. Whilst content does decide everything when it comes to blogging, it's much easier to build credability with your own domain name and profesional looking blog. If you're insistent on using a free blog, I would suggest that you head over to WordPress.com or Wix.com and sign up for a free blog. How Often Should You Be Publishing New Blog Posts? The days of having to post each week are long gone. What does matter is the content that you provide. It's much better to release one new blog post each month of epic content, than posting one new blog post each week of random words. If you look across the internet at many of the top ranked posts across Google, the majority are fantastic posts that offer the reader lots of advice and knowledge and are well over 1,000 words in length. Some are upwards of 5,000 words if it's a particularly difficult subject. One a personal basis, I would be aiming for blog post's that are at least 800 words in length, however don't worry if some of blog posts are upwards of 3,000 words. That all said, I would probably make an upper limit of 5,000 words for anyone blog post. 5,000 is a long blog post that will take the reader considerable time to read. There is a chance they will start to get bored loose interest. What Pages and Post's Should My Blog Have? As discussed above, there two types of articles you can write, “Pages” and “Posts”. Posts are typically content entries that you write to attract readers to your blog, whilst pages are typically static one-off type of content such as you’re about page or contact page. As a minimum, I would suggest that you write a minimum of 10 blog posts (Content Entries) and have the below pages to start your blog. About Page – This is where your reader can find out more about you and your story how you started blogging. Contact Page – This is a page specifically designed to show your contact details and how your reader can contact you. Sign Up Page – This page shows where your readers can sign up to your mailing list and get exclusive content about your niche. What Types of Blog Posts Should You Be Writing? Typically, there are 10 types of blog posts you should be writing across your blog to attract readers. The News Post – This is where you create a blog post about something new within your industry. CNET creates lots of great news post, here's an example of one about AirBnB making it easier to check in to their apartments. The Step-by-Step Guide – This type of blog post is where you give your readers a “How To Do Something” within your industry. 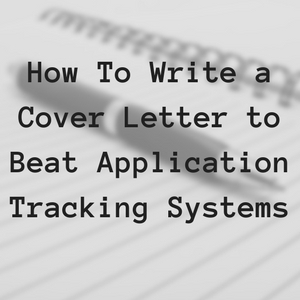 As an example, recently I wrote a Step-by-Step Guide to writing your CV. The Media Post – This is typically where you use images to make a visual presentation within your blog post. As an example, recently I wrote about 10 Great Job You Can Do Outside and used an image to represent each career. The Video Post – If you’re into Vlogging or producing daily videos, you could add these to your blog in the form on a Video Post. One of my favorite Vloggers Casey Neistat creates a daily blog on youtube and has a very successful career doing it. The Top 10 Post – This very much like the review post below, however you’re giving your readers a choice of 10 different products or experiences. As an example, here's a great Top 10 Post about Career Advice Blogs across the internet. The Review Posts – This is typically where you review a single product or experience. Review post’s are a great way to use in conjunction with affiliate marketing. 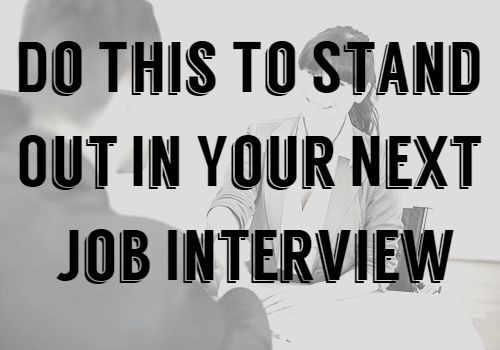 The Interview Post – As the name suggests, this is where you interview a professional within your industry and use this to form a blog post. Checklists – These are very common with food bloggers that are used in conjunction with a How to Blog Post. As an examples, here's a great checklist to create healthy food. Expert Advice – This is very similar to the interview post, however within the expert advice section, you can show your reader your knowledge and experience. Resource – This is where you provide a selection of different resources to help your readers. 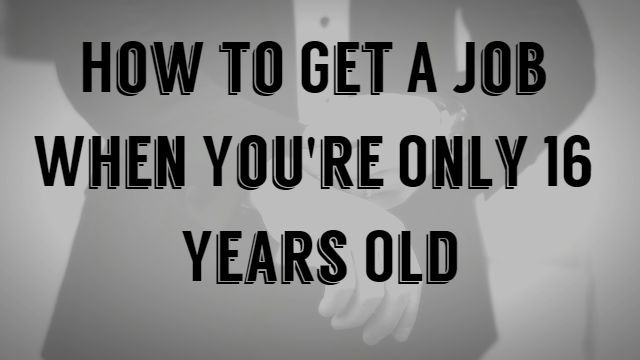 Here's a great resource from The Muse for job seekers. Still cannot think about what to write about? Here are 73 different types of blog posts to help you create content for your blog. My name Nick Jones, I am a professional Head-Hunter with over 20 years of experience working all over the world. 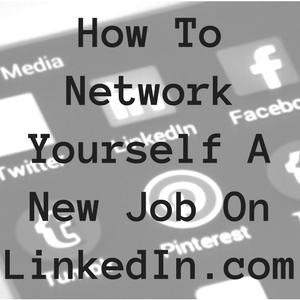 I specialise in out-of-the-box job search strategies to get your CV directly to the hiring manager, thus skipping any ATS portals or recruiters who think they're important.